Evan Kirsch got to show off his business start-up concept to the perfect audience. As a result, he earned a place in one of the nation’s leading entrepreneurship programs. Now a senior at the Henry W. Bloch School of Management and a student in the Regnier Institute for Entrepreneurship and Innovation’s Entrepreneurship Scholars (E-Scholars) program at the University of Missouri-Kansas City, Kirsch has started a business that will fulfill his purpose – help others navigate the challenge between high school and college, as well as between college and career. Kirsch was encouraged to participate in the E-Scholars program because of his insight into how a business should work. Also, the leaders of the program saw him in action – explaining and promoting his business at the 2012 Regnier Family Foundations/Bank of Blue Valley Venture Creation Challenge where he was one of the 2012 winners. 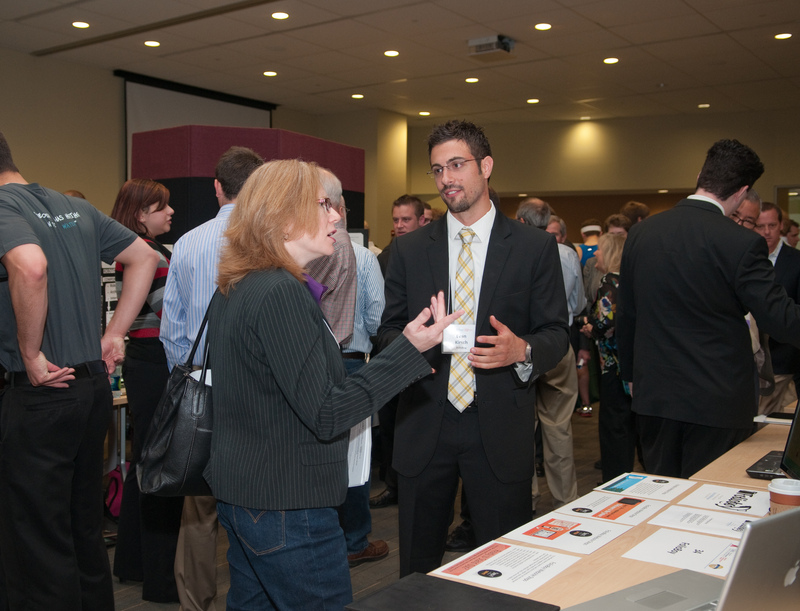 Evan Kirsch explains how FolioBoy works to a judge at the 2012 Regnier Venture Creation Challenge. “We are thrilled to have Evan in the current E-Scholar class. Evan’s idea has huge potential, and he has shown the initiative and drive needed to make his vision a reality,” said Mark Parry, Ph.D., director of the E-Scholars Program. In the 2011 and 2012 academic year, a total of 67 students graduated from the Regnier Institute of Entrepreneurship and Innovation’s E-Scholars Program; the program also launched 51 ventures. At the beginning of 2012-2013, 72 E-Scholars were enrolled in the program, representing 58 ventures. The E-Scholars program is designed to prepare “brilliant and promising entrepreneurs” with the skills needed to launch a sustainable and scalable venture. The program grows each year – offering hope and, more importantly, resources to the students who are accepted into the program. Kirsch’s company, called FolioBoy, helps students design online portfolios and share them with friends, colleges and employers. They can upload, create and publish, and they can share their work through social media and hard-copy editions of their portfolios. According to Kirsch, he is filling a need in a novel way. Both resume and portfolio services are offered for the high school senior. Eventually, students will be offered advice on the best or most appropriate colleges. College students will receive additional tools to prepare them for the job market. The current revenue model is set up for individual students upgrading to a premium account, giving them a “one up” over other students competing for the same college, the same internship, or the same job. The hardback edition of their portfolio is useful as a college acceptance tool, a keepsake or as an interviewing tool. It contains pictures, documentation, letters of recommendation, awards and statistics of their latest achievements. Kirsch’s determination and talent landed him another opportunity recently: three days with Seth Godin, the internet marketer, entrepreneur, author and public speaker. Kirsch applied and was chosen to join 19 other entrepreneurship students in New York. Godin promised to teach topics that included an understanding of basic storytelling, the realities of marketing online, and the new economics of the connection economy, and he did. He also had the group work on a collaborative project – write a book in one hour, including designing the book cover. It was then posted on Godin’s blog, with more than 50,000 unique visitors per month. Kirsch described Godin as a “brilliant, generous man” for the knowledge and the time he gave so freely. He also had wonderful words for the Bloch School. This entry was posted in Archives, Entrepreneurship and Innovation, Students by . Bookmark the permalink.